Few sights make homeowners more furious than an attractive landscape destroyed virtually overnight by hungry deer. Rose bushes and ornamentals? Nipped off every bud. Expensive shrubs? Browsed within an inch of their lives. Trees? Damaged, disfigured and sometimes dead. Deer — and their wilder relatives, moose and elk — usually leave a path of destruction in their wake, and even winter can’t calm the carnage. In fact, as cold weather descends, deer shift their sights to your most expensive and difficult-to-replace trees, evergreens and shrubbery. However, you can strike a blow against deer’s voracious appetites by maintaining a year-round program of defense with easy-to-use Bobbex Deer Repellent foliar spray. The product is an environmentally friendly, nontoxic and long-lasting deer deterrent that’s safe for people, pets, wildlife and aquatic life. Ingredients include putrescent eggs, fishmeal, fish oil, garlic and other natural ingredients — all materials that offend a deer’s sensitive sense of smell and taste. Additional ingredients such as urea and Epsom contain natural fertilizer components which are beneficial for all plantings. The product mimics predator scents, which deer have an aversion to, and is classified a fear repellent, but it also tastes terrible to deer, adding another layer of protection for plants. Because it contains effective sticking agents, the repellent won’t wash off even in harsh winter weather. And it’s been 3rd party tested against 10 other like-repellents and is rated #1 for protection against deer browse. The experts at Bobbex recommend a steady course of repellent application in every season as deer shift their feeding patterns. Since we know deer learn from experience, maintaining repellent applications throughout the year will “school” them to continually bypass your yard in favor of less objectionable fare elsewhere. Fall is a particularly active time for deer as the mating season begins, and bucks and does seek each other out. In addition, bucks begin to repeatedly scrape their antlers against trees to remove summer’s “velvet” growth from their antlers. They can kill a tree quickly with this repetitive motion, even girdling a trunk in a single night. Keep destructive deer away from your prized plantings by regularly spraying deterrent on deciduous trees, evergreens, shrubbery and perennials throughout the fall. Although you might imagine winter brings a break from deer destruction, you would be dead wrong — and expensively so. When some food sources die off and deep snow covers preferred food, deer reach up, often nibbling up to a half-bushel worth of twigs or other tree material per day. This can quickly deform or even kill landscape plantings. The continuous re-application of Bobbex Deer as seasons turn will help safeguard against inevitable, expensive deer browse. Even though we’re approaching winter weather’s doorstep, you’ll need to factor spring and summer into your year-round application process so you don’t interrupt protection. 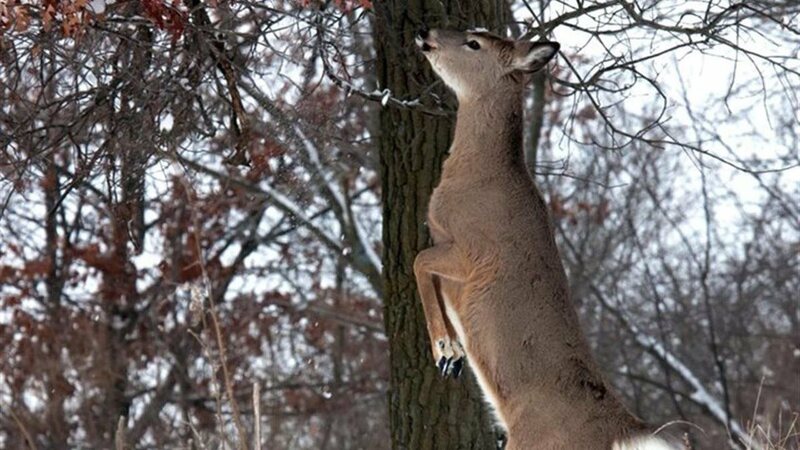 Since food is not as readily available for deer in the winter, their appetites are strong in spring. Tender shoots of new, green growth entice bucks, does and fawns, all ravenous after the ravages of winter. Because deer will return to areas where they found tempting fodder again and again, keep them on the move by applying Bobbex Deer on all stem, flower, leaf and bud growth in your yard and garden. During this peak growing season, spray repellent about every two weeks or when one to two inches of new growth appears. Unlike during the winter, it’s atypical for deer to start gnawing the bark off trees during the summer months, since available, natural food choices are easier to find. Although deer will find food in fields and forests, your yard is not out of the woods. When hot, dry summertime weather becomes the norm and natural vegetation turns brown and dies off, deer will venture out of the woods and into your yard, in search of the green, healthy plants that you’ve watered and kept thriving. 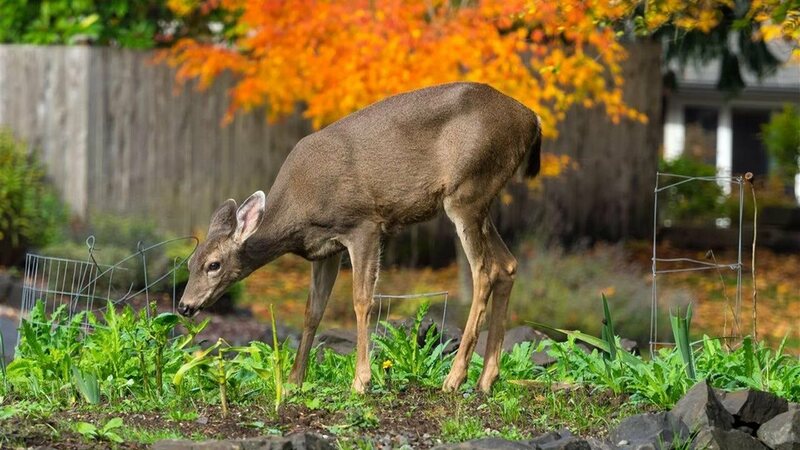 Once deer find your foliage and flowers, they’ll keep coming back unless you continue to protect your plants and teach them to stay away. Persuading hungry deer that your yard and garden is not their personal produce bar takes vigilance. With a year-round deterrent spray program, deer will soon learn to take their hungry habits elsewhere. Visit Bobbex on Facebook.